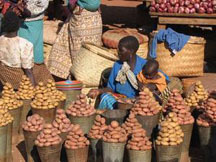 On September 23, 2005 Malawi signed a funding agreement with the MCC under the MCA's Threshold Program. Malawi was only the second threshold country to reach this step, and the first to reach agreement on a proposal that tackles the thorny issues of corruption and financial management. The MCC funded Malawi's proposal at $20.9 million over two years -- a sum that exceeds all expectations for the Threshold Program; even USG officials in country were surprised at the final sum. (Burkina Faso, the first threshold country to finalize an agreement with the MCC, will receive $12.9 million for girls' education.) So what led to Malawi distinguishing itself among the threshold countries? This Dispatch describes a number of factors contributing to Malawi's success, including fortunate circumstances as well as strategic actions taken by both the Malawi and US Governments. Elections in 2004 ushered in a new president in Malawi, only the second after 30 years of post-independence authoritarian rule under President Banda and 10 years of tenuous democracy under President Muluzi. Muluzi made early attempts to amend the constitution to allow him to run for a third term, but his efforts were defeated by public and parliamentary pressure. This surge of democratic expression on the part of Malawi's people and politicians allowed for a transition to the current President Mutharika. For donors, Mutharika represents a welcome change from Muluzi who not only wavered in his commitment to transparent governance, but had a knack for making aid money disappear. So when Malawi qualified for the Threshold Program for FY2005, the USG team in the country saw an opportunity to support a transition towards stronger democracy and a chance for the MCA to get in on the ground floor of supporting major governance reform. Mutharika started his tenure as president by making a strong commitment to fighting corruption and improving financial management -- just the areas in which Malawi fell short on the MCA selection criteria. He even took the bold step of withdrawing from the ruling party, which had effectively ushered him into power, to mark his political independence and claim space to pursue his anti-corruption campaign. As a result, he and his cabinet needed little convincing that an MCA proposal focused on corruption and financial management would complement their policy agenda. This confluence of priorities between the new administration and the MCC laid the foundation for Malawi's success in securing significant MCA funding, and doing so more quickly than other countries. The MCC has struggled to strike the right balance between fostering "country ownership" and offering sufficient guidance to candidate countries. This struggle was evident early in the Malawi proposal effort. According to one in-country USG official, the initial phase included a frustrating round of "the guessing game," during which the MCC was reluctant to offer any indication about an appropriate size or scope for the proposal. In the end, however, the MCC was responsive to Malawi's draft proposals and seems to have found a very healthy balance between guiding the process and allowing the country's priorities to shape the final proposal and agreement. What allowed for this balance to be struck in Malawi? In many ways it is easier to do in Threshold Program countries. The MCC requires that threshold country proposals be directed at one or more of the areas in which the country fell short on the selection criteria. This narrows the field considerably and saves countries from having to figure out which of its countless development priorities best fits with the MCA's mission. Thus, by its very nature, the Threshold Program offers a clear framework in which countries can exercise ownership. Two additional factors contributed to the balance between ownership and guidance: a clearly defined role for USAID as coordinator and facilitator; and a broadly collaborative process of proposal design. By agreement with the MCC, the Threshold Program sits squarely within the jurisdiction of USAID. This means that Threshold countries can mostly avoid the awkward and contentious debate about USAID's role (such as that in Mozambique -- see MCA Monitor Dispatch Lessons from Mozambique) and USAID is free to offer guidance for proposal development. Malawi's USAID staff was clearly identified as facilitators of the proposal process. Agency staff took the lead on convening meetings, supporting working groups that developed each component of the proposal, bringing in a Democracy and Governance expert from DC to offer a theoretical background on controlling corruption, and offering technical assistance in identifying indicators for measuring results. While contributing this strategic support, USAID kept its hands off the content of the proposal. All of the Malawian participants interviewed for this Dispatch emphasized that "all of the ideas are ours." One stated that "USAID Malawi should be applauded for letting this process be led by Malawians." They all said that USAID's role of convening and facilitating (i.e. one element of guidance) was critical to bringing together the relevant stakeholders. This in turn, gave participants a platform to express their ideas and define the structure and content of the proposal (i.e. exert ownership). In addition to this central role, USAID made a big difference around the edges. The agency knows the dynamics, players, and development challenges on the ground much more than the DC-based MCC staff can. This allowed USAID to serve as an important bridge between the government of Malawi and the MCC. According to one USG (non USAID) official, "USAID saved the day" in several instances by translating on behalf of the MCA team members who baffled Malawian ministers with their inside-the-beltway banter and by greasing the diplomatic wheels when MCC staff faltered in their interaction with government officials. The Mutharika administration clearly recognizes the multi-faceted nature of corruption and the fight against it. When the Ministry of Economic Planning and Development (MEPD) was chosen to be the lead agency on the MCA proposal process, it pulled in a wide range of stakeholders -- including but not limited to the Anti-Corruption Bureau, the Accountant General, the Law Commission, Parliament, the Ministry of Finance, several NGO networks, and a consortium of media professionals. Representatives from these agencies and groups were convened into a task force by USAID. The task force then divided into working groups and drafted component papers that fed into the broader proposal. Every Malawian interviewed emphasized the collaborative nature of the process -- and appreciated the structure created by USAID that allowed this collaboration to flourish. One commented on the "very unusual level of commitment" exhibited by all participants. According to respondents, this was due in part to the nature of the process and in part to the fact that, "once there is political will [to fight corruption] the technicians in government respond." train and support journalists in their efforts to analyze and report on corruption. In short, the inclusive and collaborative process yielded a proposal that includes the breadth of activities necessary for a realistic and sustained control of corruption. With technical support from USAID, the proposal-writing team was able to match its vision for improved governance and financial management with the concrete indicators of success so important to the MCC. The team put together an ambitious matrix of performance indicators that range from targeted improvement in the country's credit rating, fiscal deficit, and score on the Transparency International Corruption Perception Index, to the number of staff trained to improve public procurement, audit capacity, and financial management information systems. The matrix also tries to measure good governance in action by including indicators that track the goals of reducing the number of days to process corruption cases from over 365 to 90, and increasing the numbers of civil society organizations testifying before parliamentary committees. The timeline for completing the Malawi threshold proposal was truly ambitious. It would have been impossible to keep to such a schedule without Malawi's firm commitment, the clear and well-conceived proposal process, and the speed and responsiveness of the MCC. The USG team on the ground praised the government for being diligent and the MCC for being "fast about making decisions and aggressive about setting deadlines." Consider this: Malawi was deemed eligible for the 2005 Threshold Program in November of 2004. By March it had submitted a concept paper to the MCC (thanks to active encouragement from the US Embassy in Lilongwe). In April the MCC approved the concept paper and requested a full proposal. On June 10 Malawi submitted its proposal to USAID in DC, which in turn was to submit it to the MCC. (The dark lining of this silver cloud is that USAID in DC then purportedly sat on the proposal for two months before forwarding it to the MCC.) Upon receiving the proposal, the MCC turned it around in two weeks and the final agreement was signed on September 23, 2005. The credit for this speedy process goes to the MCC, USAID in Malawi, the members of the proposal taskforce, and to the Government of Malawi which, according to one USG official, "really performed." The ultimate success of the Malawi MCA program will depend on the MCC and USAID performing in the implementation phase, and on the Government of Malawi adhering to its vision of cleaner and more transparent governance. While everyone involved is optimistic about next steps, it's not all smooth sailing in Malawi right now. The country has just come through a heated and politically-driven impeachment debate. Some MPs who feel threatened by Mutharika's crackdown on corruption or betrayed by his change of political party were calling for his removal. As this debate ballooned and begun to distract from pressing concerns such as impending food shortages, donors jointly expressed concern about the impeachment process and suggested that opposition leaders abandon it. This move was met by the opposition's accusations of donors "interfering in internal affairs." The political uncertainty caused by this situation will be an interesting test for the MCC. Working with countries in transition is a tough business. If the MCC is going to really dig in to combating corruption, it must be prepared to get its hands dirty and plow through some rocky soil. According to one USG official in Malawi, "The MCC shouldn't be easily spooked. They have to have nerves of steel, but know when to pull the plug if necessary." Equally as important, the US Congress must be patient with the learning process, tolerate occasional setbacks, and understand that governance reform and the development process take a good long time. The MCA and Congress should be especially willing to take some healthy risks in countries like Malawi that have already exhibited initiative, effective planning, and commitment to bold reform.